On the occasion of International Women’s Day, Indian MP (Member of Parliament), Ranjeet Ranjan decided to celebrate it in style. 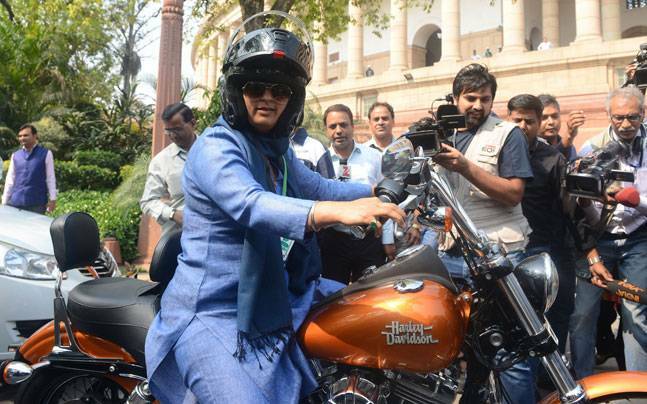 The 42 year old, Ranjeet showed off her bike, an orange Harley Davidson by first riding around the Parliament complex before entering the Lok Sabha House in order to attend the ongoing budget session. 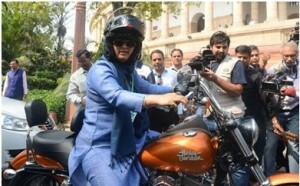 MP Ranjeet Ranjan rode to Parliament on Harley Davidson! 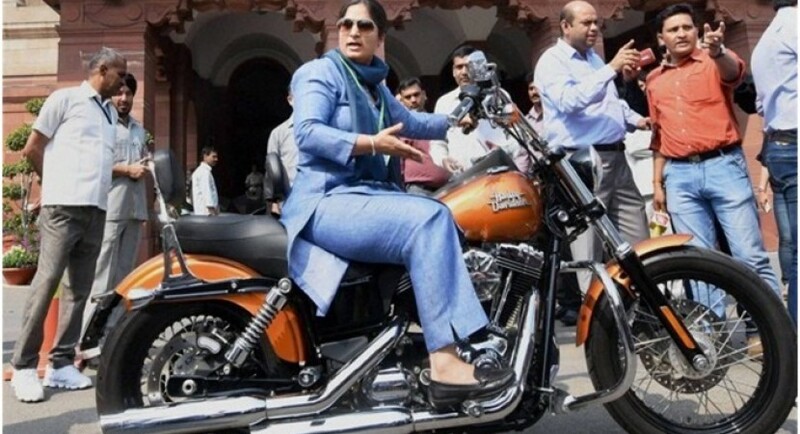 The MP Ranjeet Ranjan created a flutter in the dignified Parliament in New Delhi by driving on her bike. It was actually a rare sight, and Mrs. Ranjan did it to make a statement on the International Women’s Day. 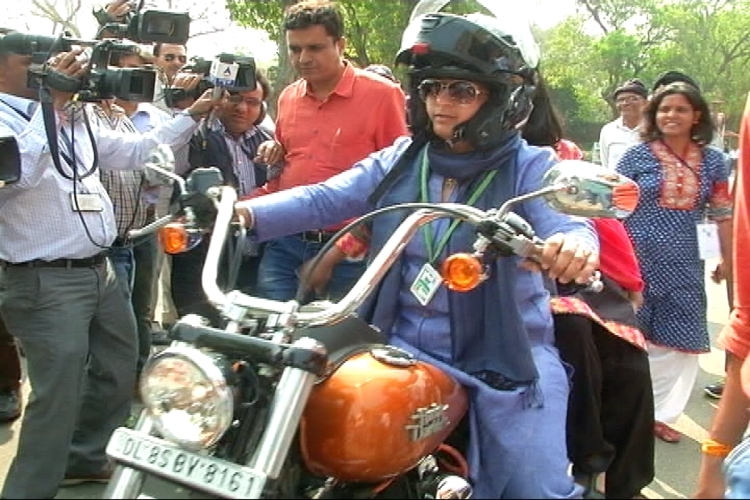 As Mrs. Ranjan rode around the Parliament complex, she was seen wearing blue attire with helmet and sunglasses. She rode around the complex just before entering the Parliament House. Later, she took part in the day’s proceedings. Ranjeet Ranjan is an Indian politician and a member of the 16th Lok Sabha as a MP, elected from Supaul, Bihar from the Indian National Congress (INC) party. And, she is married to politician Rajesh Ranjan, who is popularly known as Pappu Yadav, and he has also won the 16th Lok Sabha election from Madhepura, Bihar. Mrs. Ranjan said that she had purchased the bike, Harley Davidson from her own earnings. And, she even does not allow her husband to touch her bike! However, she further added that he does get a chance to sit pillion as she rides the American monster. Speaking on women empowerment, Mrs. Ranjan said that she believes that reservation in Lok Sabha isn’t the solution; rather it’s a part of a larger effort needed to empower women. She further said that while granting reservation, it should be kept in mind that kith and kin of women MPs don’t enter local bodies or Parliament. Moreover, its benefit should go to only those women who actually need reservation for upliftment. Mrs. Ranjan stated that she is an independent woman, who has got all the rights to do each and every thing in life. ‘My life has been such that my parents have never objected to whatever I have done so far’, she said. Also, she revealed that she was initially reluctant to ride on Harley Davidson due to the reaction of the media and others. ‘But I kept aside these thoughts and rode the bike’, she said.